Recently Ronda Rousey’s loss at Wrestlemania and how the former UFC pugilist and Olympic medalist took her defeat has a lot of viewers worried that she might be staying out of the squared circle for good. Then there’s the fact that Ronda’s no stranger to breaking Kayfabe, peppering in jibes about the WWE and management in the organization in general. This 4th-wall attack has been a huge part of Ronda’s mic-game. 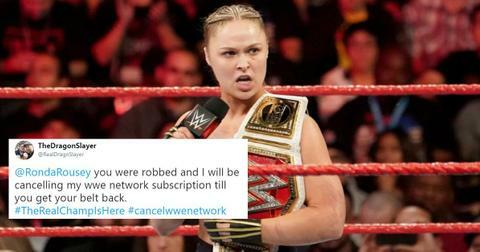 So there’s a good chance that RAW and SmackDown will be Ronda Rousey-less. Even if that is the case, that still leaves every other wrestler on the roster to account for. There are some predictions circling the internet from both fans and outlets alike as to who will be traded and who will stay put. 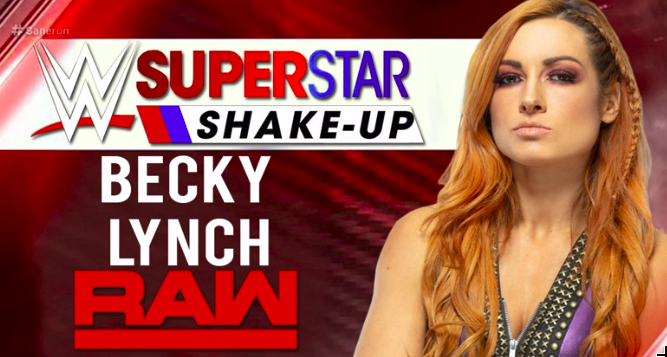 So what’s going to happen in the WWE Super Shakeup 2019? Belly Up Sports believes that RAW, being the longer-running WWE program, and given its history, will more than likely keep the lion’s share of the promotion’s stars, and I’d have to echo that. 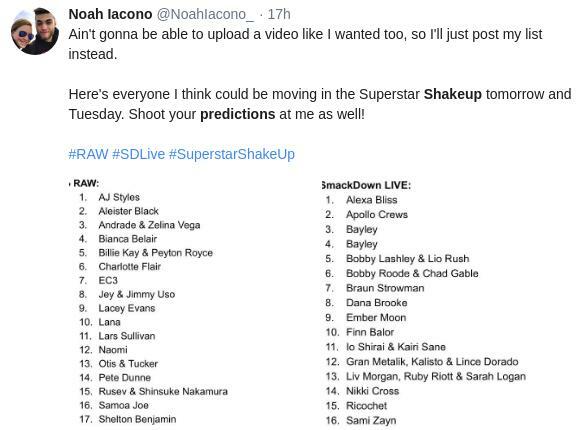 Seeing as the United States Champion and Intercontinental Champion “trade” spots, expect Samoa Joe to come to Monday Night RAW, and Finn Balor to go to SmackDown. A recent announcement from pro wrestler Paige regarding a tag team that’ll be appearing on April 15th’s RAW will probably mean that Kairi Sane and Io Shirai from NXT are brought into the RAW fold for some leveled-up promo’ing. Which makes sense because Io is a huge fan favorite and it doesn’t make sense to leave her off of primetime spots. AJ Styles has been a mainstay at SmackDown for a while, so it’ll probably make sense for him to head on over to RAW as well to breathe in some new life and give him some interesting character arcs. Belly Up went on to predict that SmackDown might be getting some bigger names this year and it’s a bit of a hot take, but I do think that they’re on to something. There’s been a lot of news about Roman Reigns’ successful battle with Leukemia. Now that it’s in remission and he’s headed back into the ring, I do think that a good way to infuse some new life into SmackDown would be to put Reigns on there. Here he could “reign” the roost and be a huge star, drawing more eyes to Tuesday night’s show. This theory also makes a lot of sense now that Dean Ambrose is leaving and the Shield no longer being a thing. Pete Dunne’s been crushing it on the NXT shows, and has been the champion over there for almost two years. The loss that he recently suffered is a great way to graduate him from the NXT rounds, build up Walter as a persona, and let Pete along with possibly the rest of British Strong Style to make a name for themselves on SmackDown. Braun Strowman also hasn’t exactly made waves on RAW, so a nice little shakeup may be sending him to SmackDown. These are some pretty popular opinions, but there are also some other ones that have been circling the web. 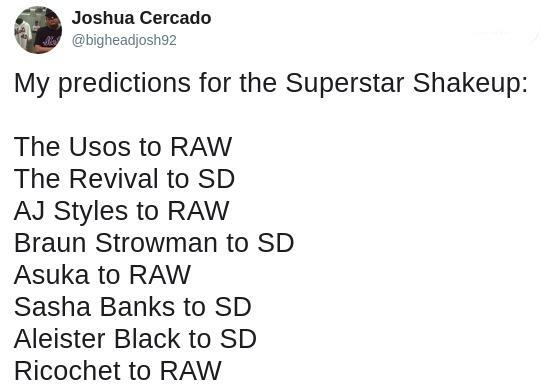 Namely, that Ricochet will be making RAW his new home tonight, along with The Usos. Ultimately, we’ll find out where everyone on the roster stands tonight at 8pm on Monday Night RAW!